The February issue of the Bulletin has been published and is available in both print and electronic versions. 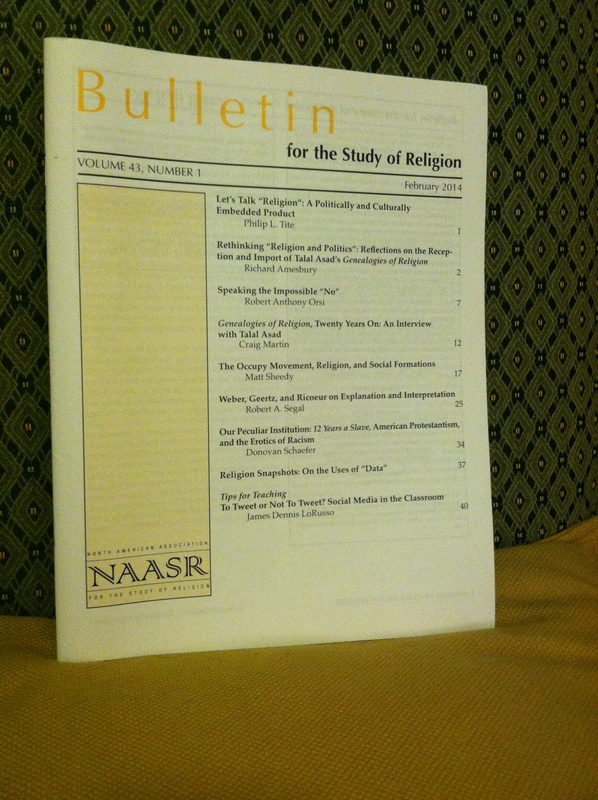 Below is the table of contents of this issue, which includes a set of papers marking the twentieth anniversary of Talal Asad’s Genealogies of Religion. We have pieces from both Richard Amesbury and Robert Orsi engaging Asad’s work along with an interview with Asad conducted by Craig Martin. In addition, we have articles from Matt Sheedy on the Winnipeg Occupy Movement and Robert Segal on the concepts of “explanation” and “interpretation” in Weber, Geertz, and Ricoeur’s treatments of religion. In addition, Donovan Schaefer offers a film review of 12 Years a Slave. Included in this issue is also one of the first “Religion Snapshots” from our blog. We chose the roundtable on the question of “data” as a constructed taxon in the study of religion. We also include another “Tips for Teaching” piece, this time coming from the pen of James Dennis LoRusso on technology and social media. This entry was posted in Announcements, Craig Martin, Dennis LoRusso, Donovan Schaefer, Film Reviews, James Dennis LoRusso, Matt Sheedy, Pedagogy, Philip L. Tite, Politics and Religion, Religion and Popular Culture, Religion and Society, Religion and Theory, Religion Snapshots, Theory and Method, Theory in the Real World, Uncategorized and tagged 12 years a slave, Bulletin for the Study of Religion, Data, Genealogies of Religion, Occupy Movement, Religion, religious studies, Robert Segal, scholarship, Sociology of Religion, Talal Asad, technology. Bookmark the permalink.